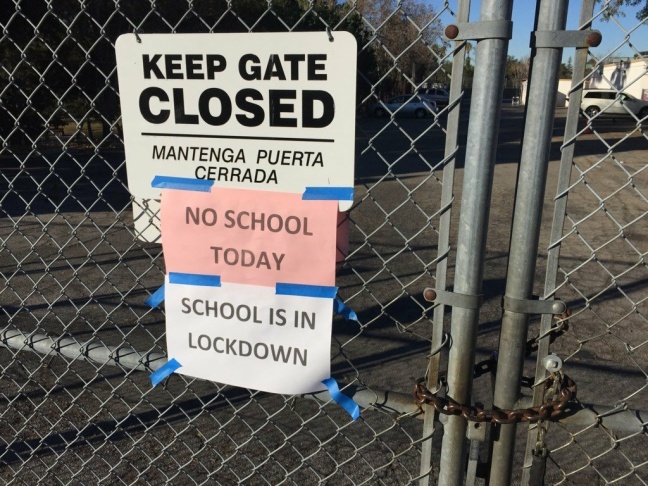 San Pascual Avenue Elementary School in Highland Park and all LAUSD schools are closed following Tuesday's threat of violence on Dec. 15, 2015. 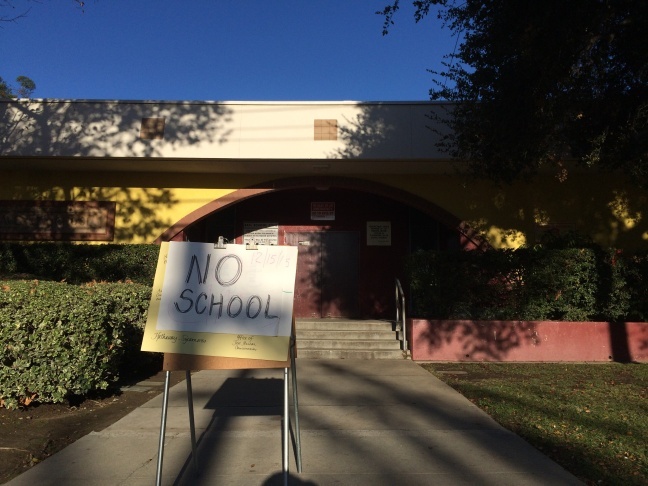 A closure announcement at Rio Vista Elementary in North Hollywood as LAUSD schools close following a threat on Tuesday, Dec. 15, 2015. 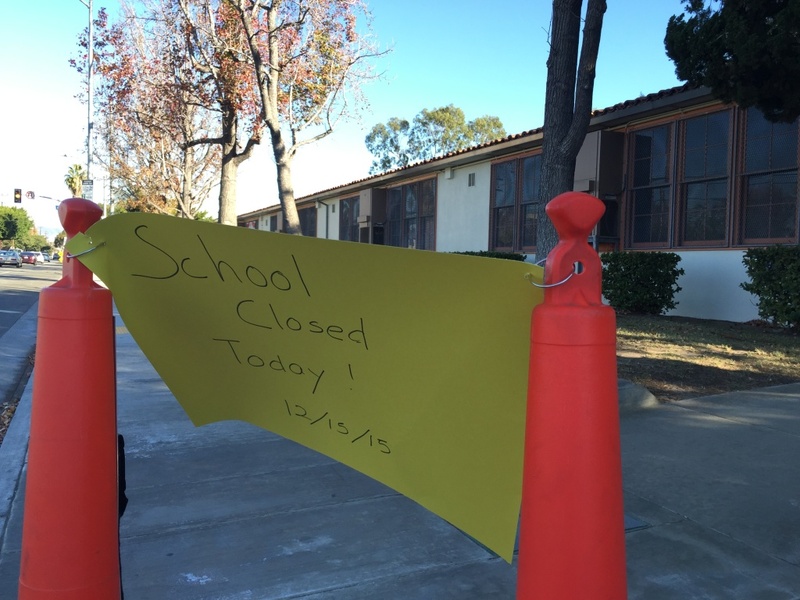 San Pascual Avenue Elementary School in Highland Park was closed Tuesday following the bomb threat. All Los Angeles Unified School District schools, including Toluca Lake Elementary, were closed Tuesday morning due to a bomb threat. All Los Angeles Unified schools are scheduled to reopen Wednesday following a district-wide closure prompted by a threat of violence. The district gave updates on the situation late Tuesday via news conference and a statement on the district's website. Officials said the threat turned out not to be credible and that the motivation for sending the email remains unknown. Students and employees "who may need additional support" will have access to crisis counselors Wednesday, according to a statement from Superintendent Ramon C. Cortines. Earlier in the day, a city utility truck hit and killed a 17-year-old boy who was heading to school because he apparently didn't know a threat had shut down all campuses, according to the Associated Press. Detective Charles Walton said the crash happened at an intersection around 7:10 a.m., AP reports. The school closures in L.A. caught the attention of at least one candidate in Tuesday night's GOP debate. As AP reports, New Jersey Gov. Chris Christie said the closure is evidence that President Barack Obama and former Secretary of State Hillary Clinton have not done enough to keep people safe. Councilmember Joe Buscaino took to Facebook today to voice concerns about the lack of real-time communication around today’s school closures. "I urge #LAUSD to learn from today’s events and embrace technological innovation to ensure that in emergency situations parents and students are informed in the fastest way possible,” he wrote. Many parents echoed that sentiment in comments — some saying that they were notified after 9 a.m. He hopes this will be a teachable moment for the district so it can develop methods to expedite notifications for parents going forward. 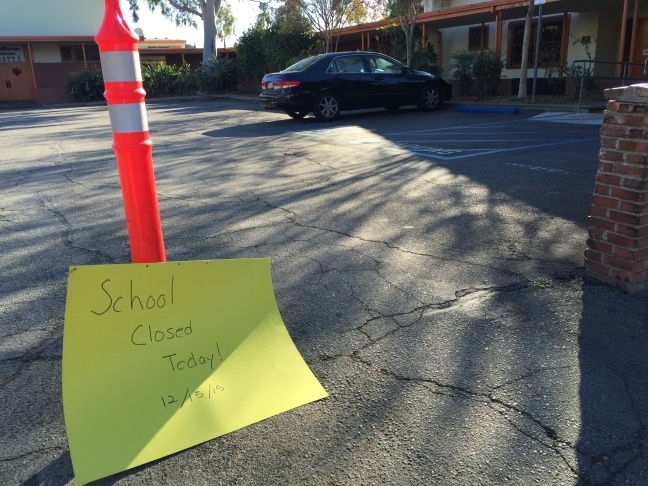 An email threatening L.A. Unified School District that prompted officials to close all schools Tuesday was specific, said Congressman Brad Sherman of the San Fernando Valley. Sherman read the email after offering help to the district as a longtime member of the House Foreign Affairs committee with some understanding of terrorist threats. 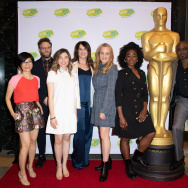 “The email said the author together with 32 accomplices would be hitting the L.A. Unified School District schools in just about every way you could think of — pressure cooker bombs, Kalashnikovs, automatic pistols and even nerve agents,” said Sherman. The email purports to be from a “devout Muslim” but doesn’t reflect any knowledge of Islam, the congressman told KPCC. There are no references to the Quran or life of Mohammed, the email at one point fails to capitalize the word Allah, and the sender’s address includes a pornographic name of a body part. “In that way, it lacks credibility,” Sherman said. He also questioned whether 33 people could plan an attack and go undetected by law enforcement authorities. Sherman said New York authorities knew about the threat in Los Angeles when it decided the threat was not credible. But he said L.A. school officials did not know about the threat in New York before deciding to close the schools. Had they known, Sherman said, it may have influenced their decision. But Sherman and school officials said the decision came in a context, just two weeks after the attack in San Bernardino and a month after the slaughter in Paris. “Look, if San Bernardino had not happened, maybe a different decision would have been reached,” he said. While Sherman said he was unwilling to second-guess school officials, he said the FBI needs to provide faster analysis of threats for local authorities trying to decide on proper precautions. “We need a better, more centralized system by which federal experts can advise local authorities,” Sherman said. Superintendent Ramon Cortinez said he consulted with the LAPD before deciding to close the schools. Still unclear is the extent to which he consulted federal authorities and whether they advised him in any way. 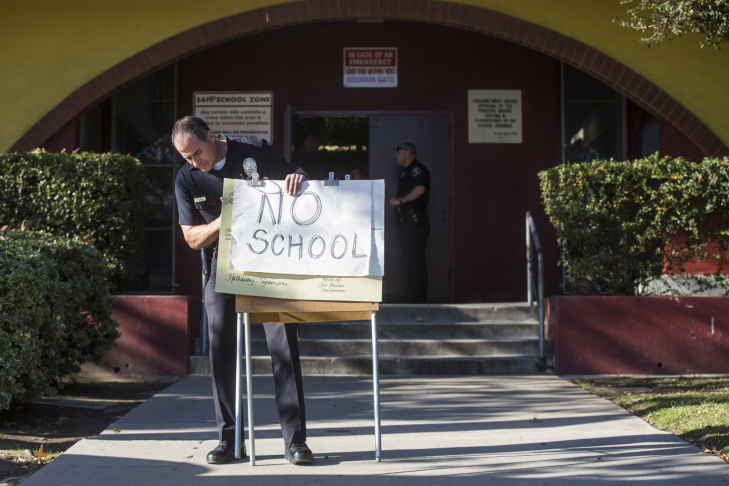 All Los Angeles Unified School District schools were closed Tuesday morning due to a threat of violence, LAUSD Superintendent Ramon Cortines announced at a morning news conference. House Intelligence Committee member Rep. Adam Schiff issued a statement early Tuesday afternoon saying that the preliminary assessment of the threat is that it was a hoax or "designed to disrupt school districts in large cities." "In an environment in which it is very easy to transmit threats, real and otherwise, and when fear and disruption may be the goal as well as the effect, communities and law enforcement will need to make a difficult judgment as to how to respond in a variety of circumstances," Schiff went on to say in the statement. Cortines said that the threat was made to students, and that the threat was to many schools. He said that the threat was related to backpacks and other packages. Cortines called for all schools to be searched Tuesday for bombs or other threats to make sure they were safe for students to return on Wednesday. Between 75 and 80 percent of LAUSD schools had been cleared as of early Tuesday afternoon, ABC7 reported, citing the LAPD. They hoped to clear the remaining LAUSD schools by 7 p.m.
New York City officials said they received the same threat as the one that closed LAUSD, but they concluded that it was a hoax, the Associated Press reported. Former LAPD chief and current New York Police Commissioner William Bratton said he thought the LAUSD closure was an overreaction by L.A. officials. Bratton said that a note was sent to a school superintendent from someone who claimed to be a jihadist, but that they made errors indicating it was a hoax. Bratton said that one of those indications is that "Allah" wasn't spelled with a capital "A," CBS New York reported. "That would be incredible to think that any jihadist would not spell Allah with a capital ‘A,'" Bratton said. The LAPD was contacted "very late last night" about a message delivered to multiple members of the school board, LAPD Chief Charlie Beck said at a 10 a.m. news conference. They became concerned, Beck said, and tried to vet the information with the FBI and the Joint Terrorism Task Force. "I think it's irresponsible to criticize the decision," Beck said. "I would say this to people who are critical: It's very easy to criticize the decision based on an outcome you don't know. It's also easy to criticize the decision when you don't have responsibility for people's lives." Beck said that the original email was routed through Germany, but that its actual origin has yet to be determined and that officials believe it's from somewhere "we believe to be much closer than Germany." He said that it was specific to LAUSD and was a threat to all LAUSD schools, with the threat including explosive devices, assault rifles and machine pistols. "I understand the concern families must be feeling this morning, but it is critical we remain calm," Garcetti said in a statement. He noted that the decision had been made by the school district, but in a later press conference, he said, "The decision to close schools was not mine to make, but it is mine to support." Cortines said at the same press conference that school authorities would not be answering questions from the press at that time. 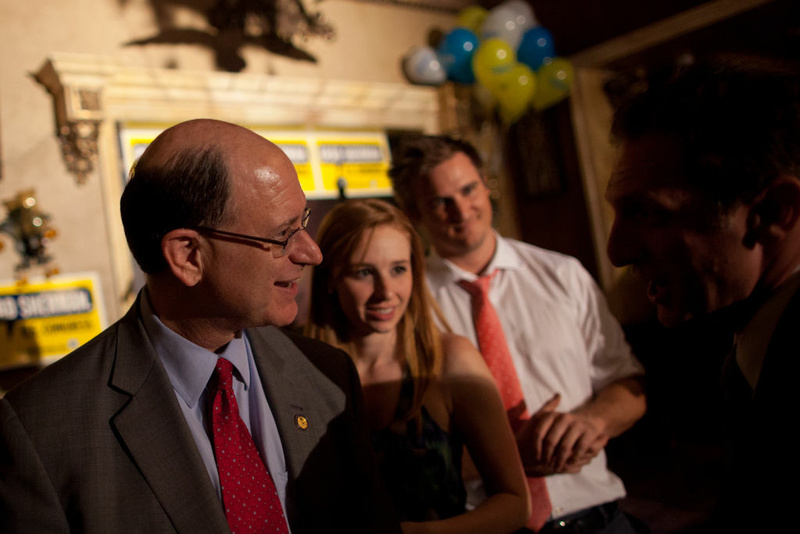 "The author [of the email] claims to be an extremist Muslim who has teamed up with local jihadists," California Rep. Brad Sherman said in a statement, saying that he had reviewed the email sent to an L.A. school board member. "We do not know whether this email is from a devout Muslim who supports jihadists or perhaps a non-Muslim with a different agenda. ... The only thing we know is that the email was sent by an evil person ... The text of the email does not demonstrate that the author has studied Islam or has any particular understanding of Islam." School authorities said at a morning news conference that they had received a threat, prompting them to alert the L.A. School Police Department, the LAPD and the FBI. The LAPD was deployed near schools, L.A. Mayor Eric Garcetti tweeted. The decision to close schools was made in light of the recent shooting in San Bernardino, as well as national and international events, Cortines said. "I as superintendent am not going to take a chance on the life of a student," Cortines said. All students were safe at the time, according to Cortines. L.A. School Police confirmed that students who were already at schools were going to be sent home. Students and staff were being directed to stay away from schools. LAUSD is asking parents who've sent their children to school to return and pick them up at the school's reunion center. Parents who haven't sent students off are asked to keep them at home. The district had set up a hotline for parents to get more information at (213) 241-2064. You can also sign up for updates from L.A. school police by texting "laspd" to 888777 on your phone. School Police said on Twitter that the threat was credible and that students who had already arrived at school would be with staff until their parents or guardians could be contacted. They also told parents that ID would be required when picking students up from school. "This is a rare threat. 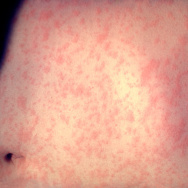 We get threats all the time," Cortines said. 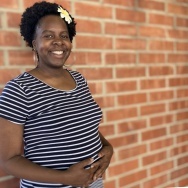 "We are taking this action in an abundance of caution to make sure that every child in L.A. Unified School District, every employee is absolutely safe," said LAUSD School Board President Steve Zimmer. "Right now, we ask parents, families, if you have not yet sent your children to school, do not send them to school." Zimmer said he would have families meet their children at the reunion gates of all schools. "We need the cooperation of all of Los Angeles today. We need families and neighbors to work together with our schools, and with our employees, to make sure our kids are safe throughout the day," Zimmer said. Zimmer also asked for employers to show flexibility with parents. "Based on the information that we have, this was a very generic piece of writing sent to a number of different places simultaneously and also written in a fashion that suggests that it’s not plausible, and we’ve come to the conclusion that we must continue to keep our school system open," Mayor Bill de Blasio said, CBS New York reported. "In fact, it’s very important not to overreact in situations like this." "We're just, y'know, we're wondering if this is actually real. Pretty sure i'm not the only one who's afraid," Wilmington Middle School eighth grader Brian Gonzalez told KPCC media partner NBC L.A.
Garcetti tweeted that he'd arranged for LAUSD students to ride Metro buses and trains for free Tuesday due to the school closures. 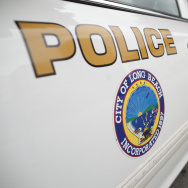 L.A.'s emergency operations center has been activated due to the threat. Buses were returned to their lots because they're not picking up students, Cortines said. LAUSD is the nation's second largest school district, with more than 640,000 students at more than 900 schools and 187 public charter schools. This is the first time in the district's history that it has closed all schools, responding to a bomb threat.